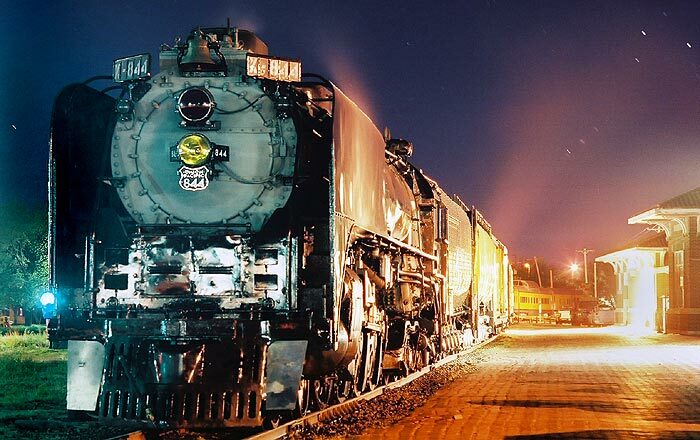 We were quite enraptured with Union Pacific's classic steam locomotive 844 when it came through Kansas in April. We weren't the only ones. See that line of traffic to the right in the picture below? Those are "railfans", hobbyists who devote themselves to the pursuit of railroads, and they are driving alongside the train, jockeying with each other to parallel the locomotive in order to take pictures, video or simply experience the locomotive in...well, locomotion. There was so much interest in 844, in fact, that I added lots of photos to my original post of last month and am bumping it up to the top. 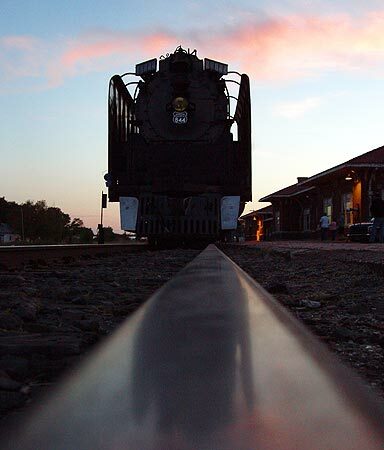 I was once such a railfan, long, long ago, during the twilight of the diesel streamliners. I lost interest when all of the ones in my area were retired. I have very little experience with steam engines, having been born a bit after their general exit from the American landscape, but this I know: they're really, really cool to see. I chose not to be part of the pack chasing this one and waited instead under the I-135 overpass in Salina, KS, for 844 to come to me. 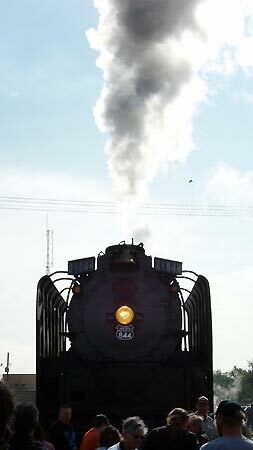 And it did, heralded by a satisfying clamor of whistling, smoke and steam. 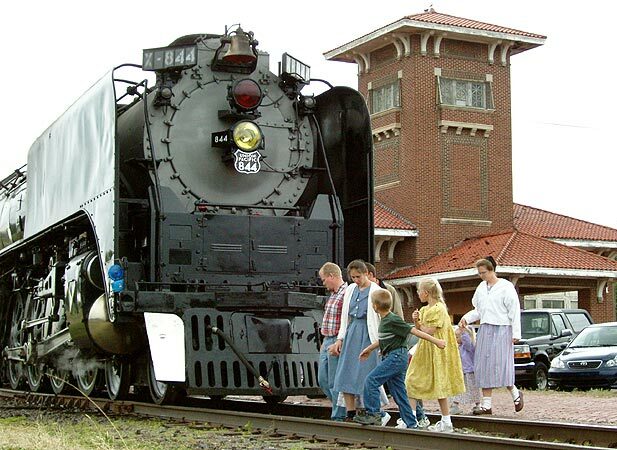 The locomotive stopped at the Salina Union Pacific depot April 29, 2006 where it was displayed for a day and a half as part of its 35-day, 10-state South Central States Heritage Express Tour. 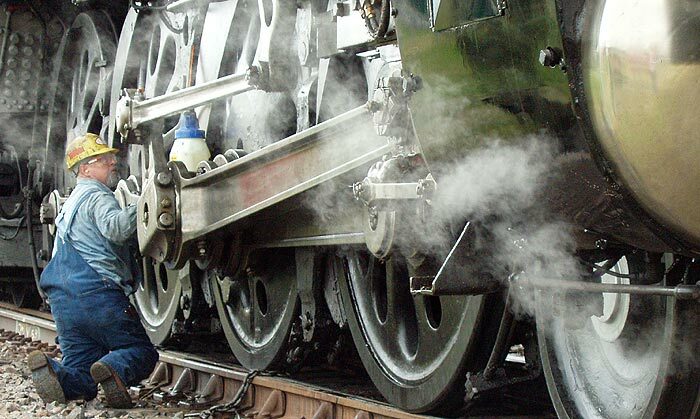 immediately after stopping, crewmen set about the business of lubricating the locomotive. 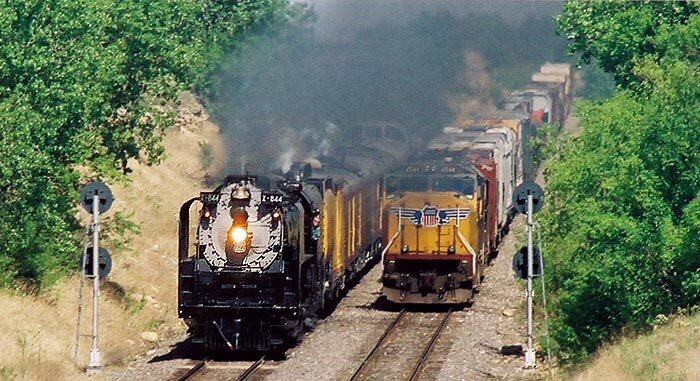 This is one of the factors that doomed steam locomotives; diesels require less maintenance. In Salina, Ace Jackalope mans the cab with engineer/fireman Ed Dickens. 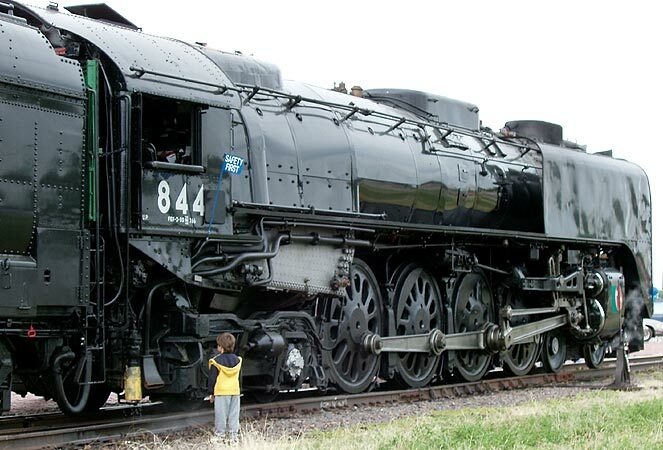 844 must look huge to that kid; of course, it looks pretty big to an adult. 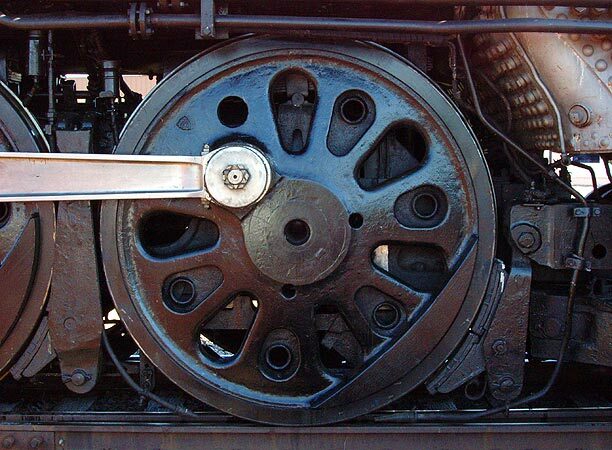 Those four big wheels in the center, the "driving wheels" that actually move the locomotive forward, are 80 inches in diameter, by the way. The lad above is probably looking at this. 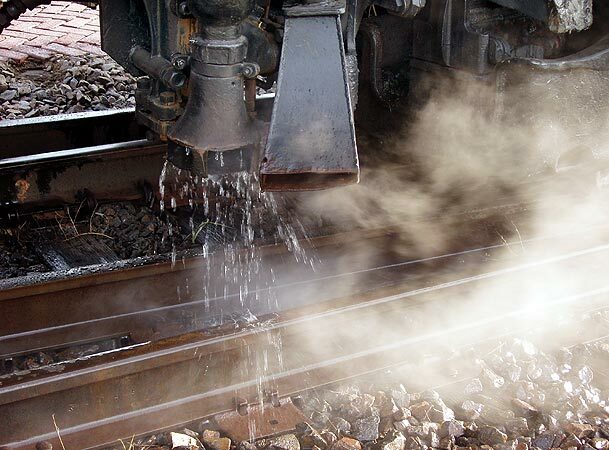 Water which has cooled a boiler injecter drips onto the track. Just an aside: this is the brickwork on the platform of the depot, which was originally owned by the Chicago, Rock Island and Pacific railroad before UP bought Rock Island. Ever notice how many brand new maps still list long defunct railroads? This is part of the left underside of the forward truck (a set of wheels). 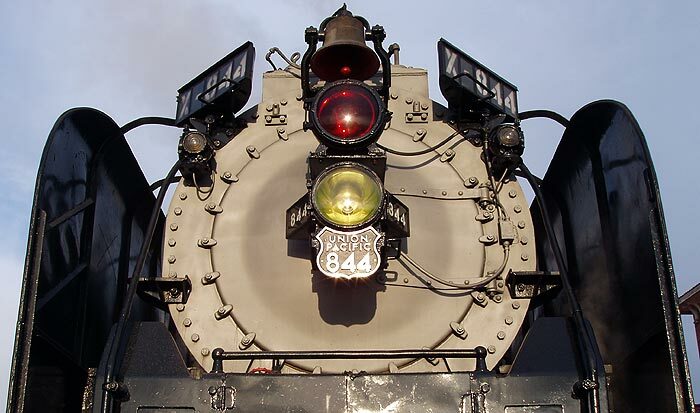 844 was built by the American Locomotive Company (Alco). 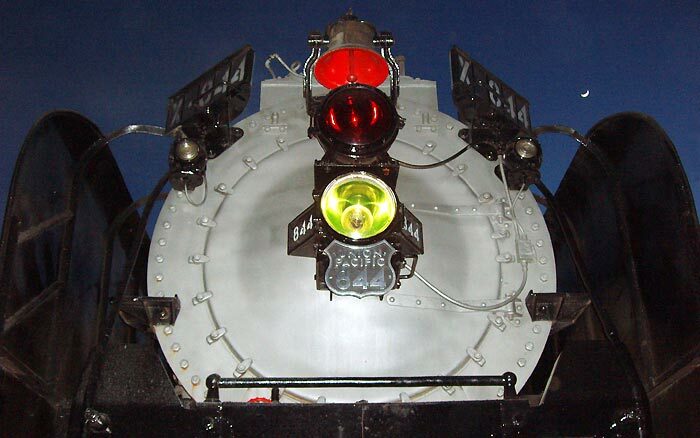 Alco was formed in 1901 and made some of the best steam engines ever built. Alco competed for awhile in the diesel market before going out of business in 1969, a casualty of the crushing competition between General Motors and General Electric, who still lead the market today. The data on this reads: U.S. Pat. 1510539 40AS43 Canada Pat. 1923 41S3987. I love looking at the details of this machine. UP owns another Northern Class steam locomotive, which they use as a parts donor for 844; they also mill brand new replacement parts for 844. 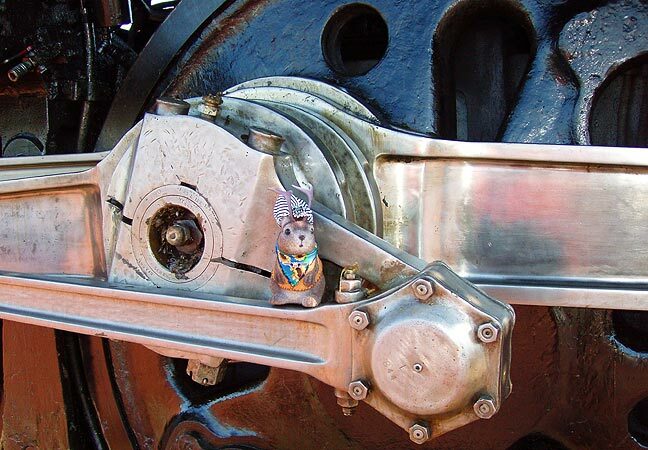 They even carry a number of spare parts in one of the railcars behind the locomotive and can do limited fabrication on the road. These parts underneath the tender are called spring rigging. 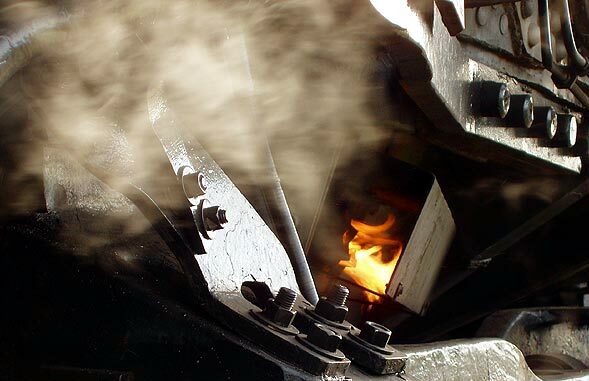 When the locomotive is moving, steam-operated pistons move these arms which, in turn move the wheels. The overall effect is not unlike a "busy box" in a child's crib: lots of stuff in motion. I couldn't resist the urge to play in black and white with this one. 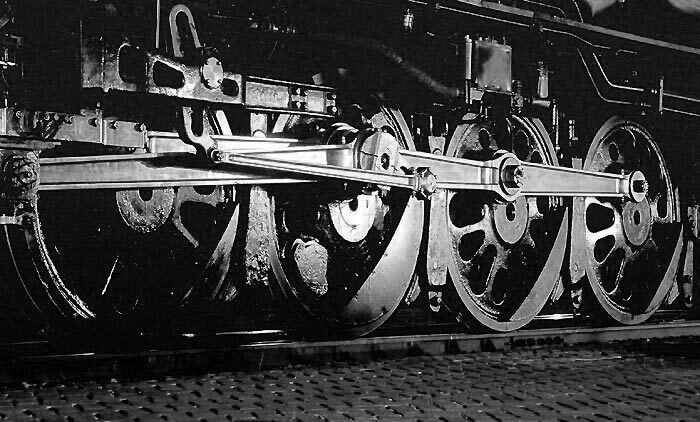 I won't go into the complexities of a steam engine (which is good, because I don't know) but there is a great animation at the wikipedia listing for locomotive. 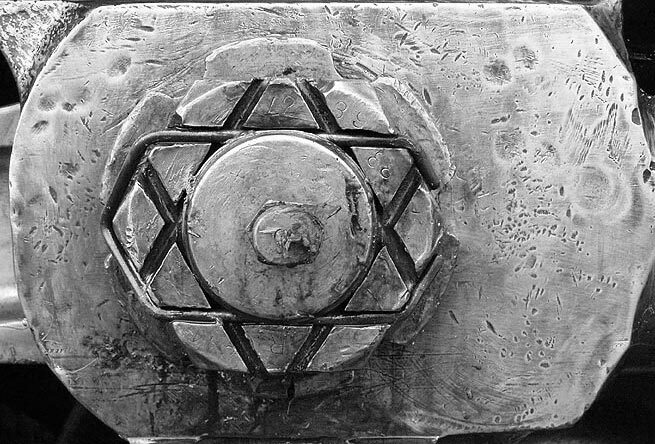 The parts that are shaped like a Star of David are called crank pin nuts. 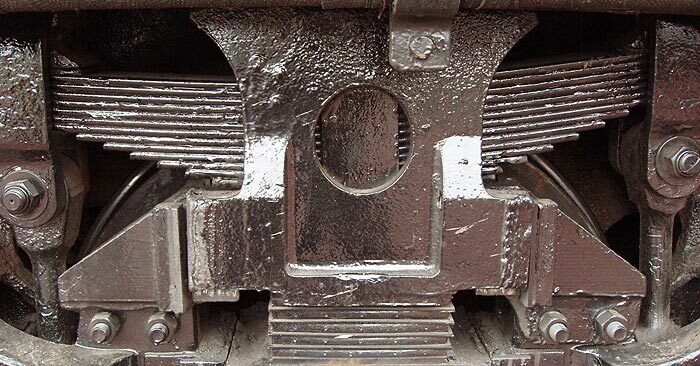 The little tube to the left of the wheel, right down by the track, sprays sand onto the rail when the locomotive needs more traction. 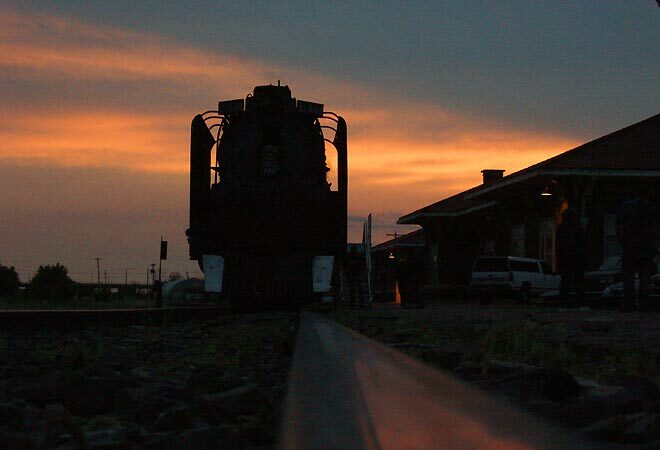 It was a heavily overcast in Salina on Saturday, April 29, but there was a bit of color behind 844 at sunset. ...and again at sunset Sunday the 30th. Visitors to 844 do not stop at the end of daylight. All evening long and well into the night, someone or other stopped to see it, to photograph it. Most fun of all for me to see were the people who just stumbled across it on evening drives or walks. Here, a father positions his son for a picture during my time exposure. I can never resist working the crescent moon or the full moon into a picture. I hadn't noticed the red inside the bell, but the flash sure picked it up. Steam was ever-present around 844; it was like the thing was alive and sometimes its exhalations would curl about it like a shroud. 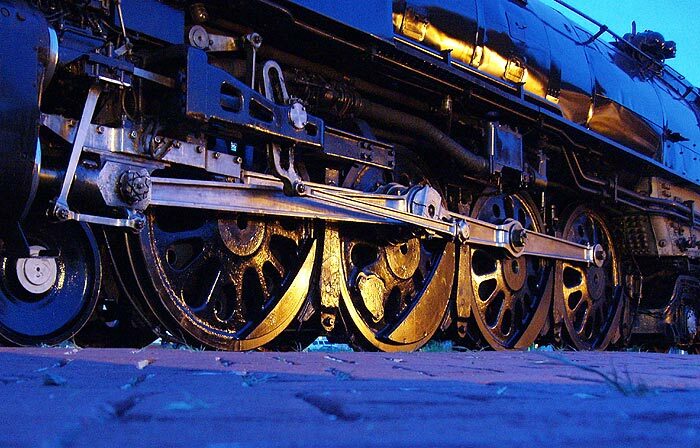 The blue of dusk mixed with the various color temperatures of the surrounding artificial lights creates a somewhat colorful black engine. Sometimes it's worth laying on ground on your tummy to get a picture. At the risk of over-romanticizing, things like this are like living myths to me. 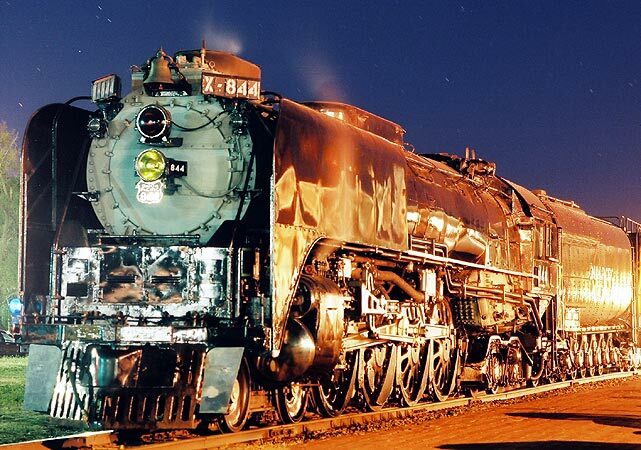 We've all seen steam engines in movies, new and old; but how many of us have seen one in the wild, as it were? I wondered what all those kids who were awed by this thing in the daylight would have thought of it at night. Would it have the aura of the Hogwarts Express or the Polar Express? Long into the night I stayed with 844, sometimes shooting pictures and sometimes, just looking and listening. Occasionally another admirer would come along. A young woman who worked in the Wal-Mart photo lab and had seen my pictures (I used film for some shots) made it a point to come by. "I'm in love with this beast" she said. 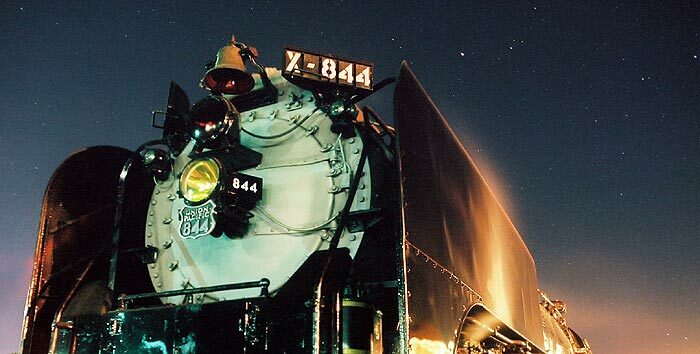 At certain moments, depending on which artificial lights were active, 844 took on a film noir look. 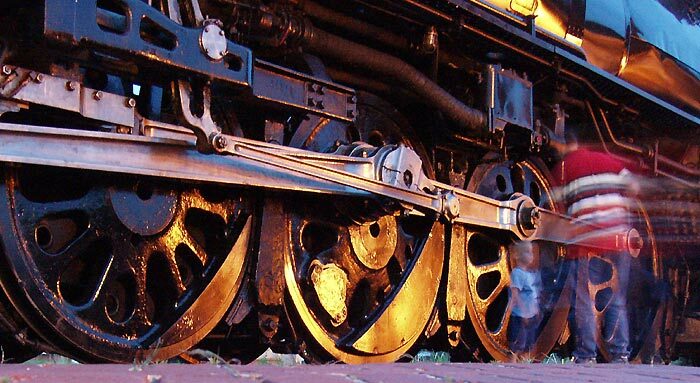 Actually, the light on the driving wheels in this picture comes from car headlights in the station parking lot. In a 30 second exposure, it was paradoxically colorful. The low color temperature of the security lights on the station makes them look orange on film. 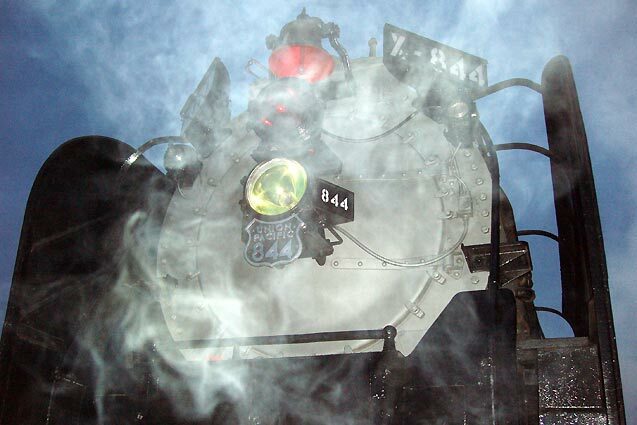 They back-light steam escaping from 844. There's a reason for the small amount of steam. An engineer would later explain to me that unless steam from the still-warm boiler is allowed to escape, it might build up enough pressure for one "chug", and the locomotive would surge foreward. Like I said, I spent a lot of time with 844. It was as if the railroad had parked beautiful still life subject for my convenience. The railroad police kept watch but were very tolerant of me and my tripod. This is my favorite shot. 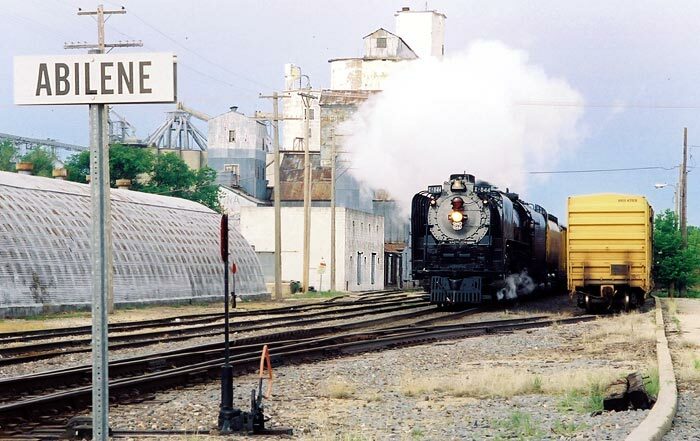 Monday morning, May 1, 844 prepares to leave Salina on an eastward leg of its journey. 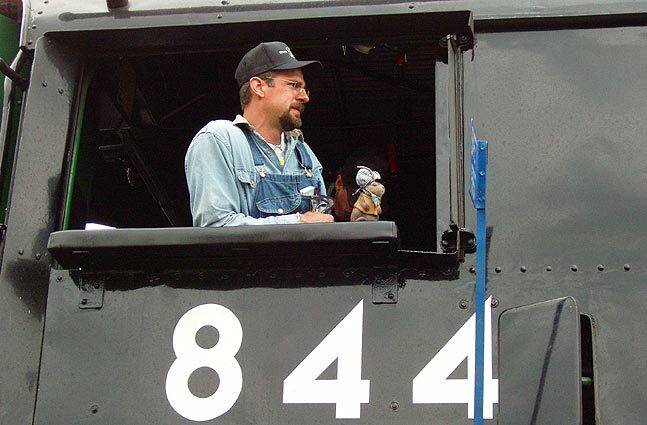 Ace, having noted that railfans adorn themselves with patches and pins, disguises himself likewise with souvenir pins from the gift shop in one of the train's passenger cars. 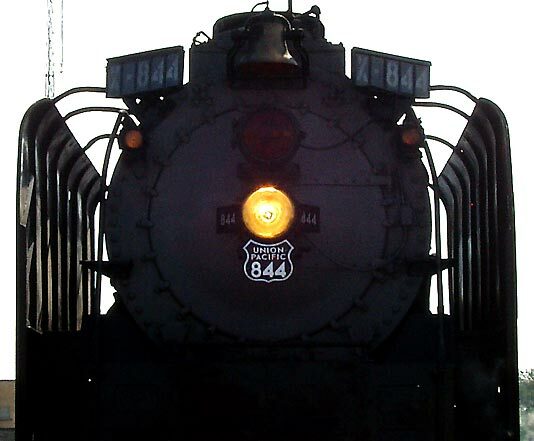 Before departure, 844 gets louder, smokier and steamier. I think it has to build up pressure in its boiler. 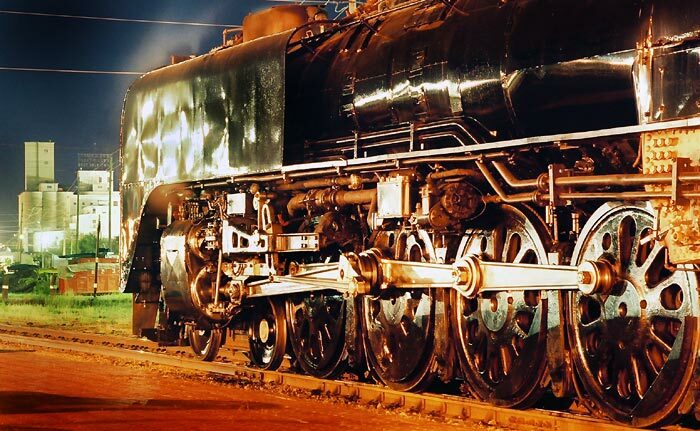 A steam engine is a creature of fire, of water and of steel. Pulses of of flame, not unlike a fast heartbeat in rhythm, can be seen emerging from air tubes underneath the cab area as 844 fires up. 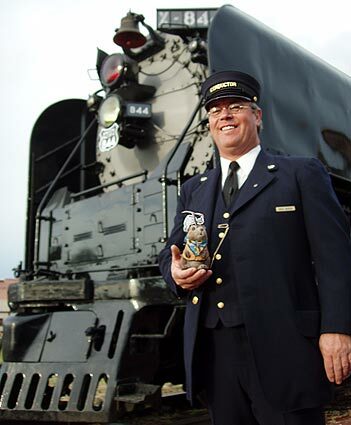 I hadn't noticed conductor Reed Jackson before; he was a reminder that this train actually carries a few lucky passengers - guests of the UP. Most are railroad employees and their families or local freight customers and city dignitaries. 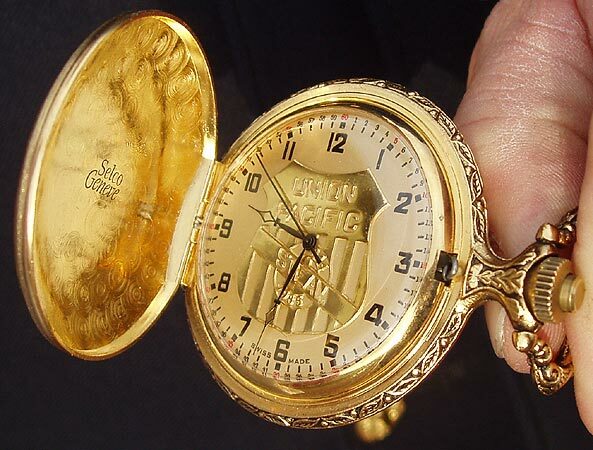 Jackson's pocketwatch does not show the correct time; it was actually 7:53. 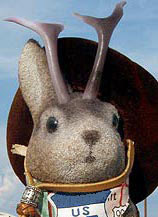 He is not remiss, however; his wristwatch was quite accurate. I left Salina right before 844 departed and drove east along its path. 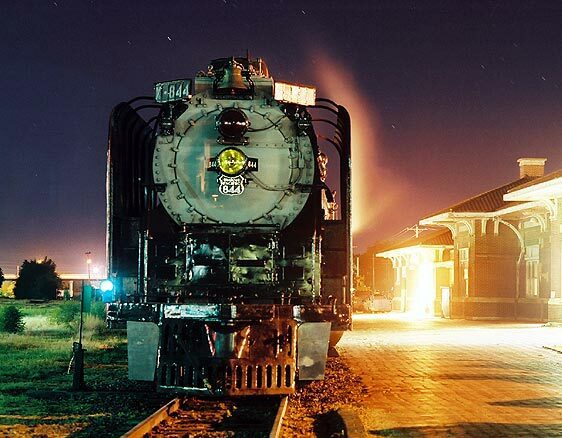 I next saw the locomotive at Abilene, KS. On-lookers cover their ears at the loud whistle. For a few minutes, something neat was happening...well, neat if you're a railfan: there were two Alco locomotives in Abilene; they were just a year apart in production but products of different technologies. 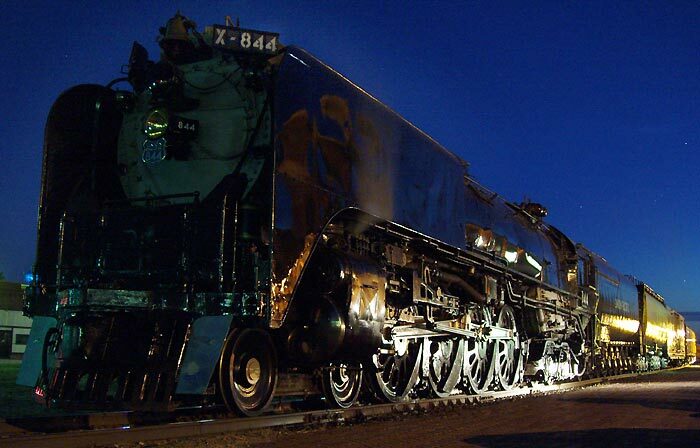 Aside from 844 as it shot through, a 1945 Alco diesel S-1 switcher lives here on the Abilene & Smoky Valley Railroad Association, a tourist line that offers dinner trains. 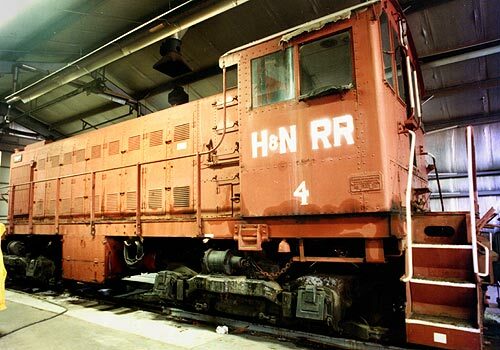 I don't have a current picture of it, but here it is in the early 1990s when it belonged to its former owner, the Hutchinson and Northern Railway in Hutchinson, KS. Later that day, I waited for 844 at the Highway 77 overpass northeast of Herrington, KS. 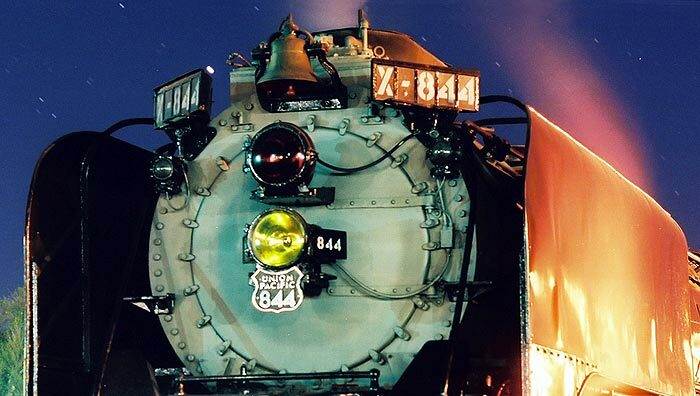 844's South Central States Heritage Express Tour is designated "hot" by the railroad. That means it supersedes all other train traffic, like the freight that has had to pull onto a siding. 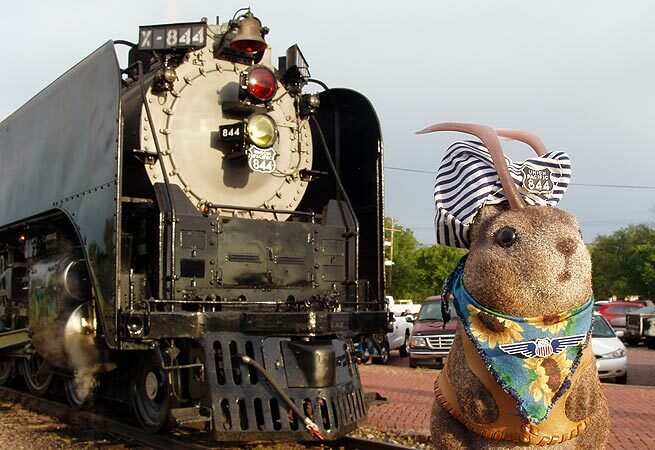 The locomotive spent the rest of the day and all of Tuesday in Herrington. 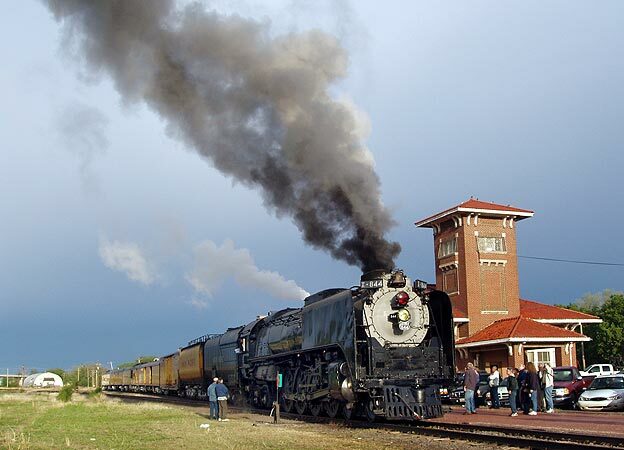 844 left Herrington Wednesday morning, May 3, and arrived in Hutchinson, KS at about 9:45AM, fifteen minutes ahead of schedule. Here, it passes grain elevators near Lorraine Street and Carey Blvd. 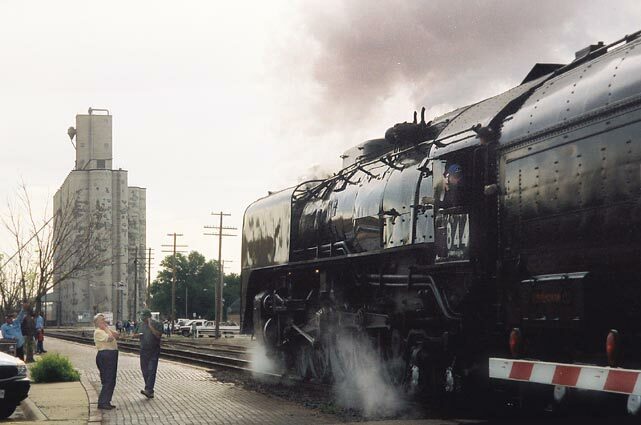 A large crowd had gathered at the Union Pacific depot at Main and "D" streets to see the engine serviced. Hutchinson has notoriously mineral-laden water, the bane of every home-owner's water heater. Part of me wanted to run up to the guys hosing Hutch water into the tender and say "Hey! You don't want to put THAT in there!" 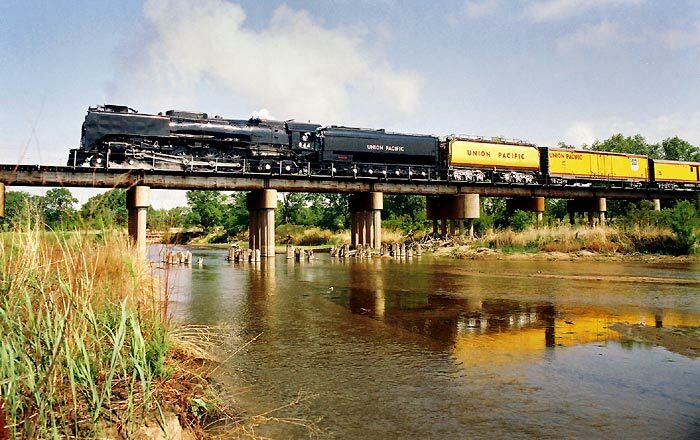 I have since learned that Union Pacific tests the water first. 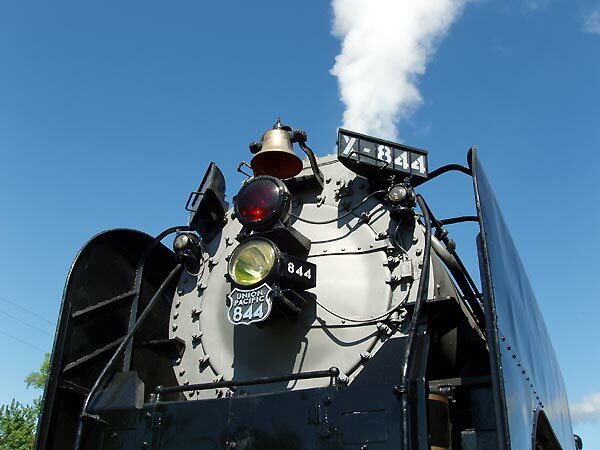 "Elephant ears", "wind wings" and "smoke lifters" are some of the names given to the metal sheets on either side of the front of 844. The engineer told me they serve the function of creating an airstream to direct exhaust smoke away from the train's air conditioner intakes. Now this was really cool...literally: it was about 10 in the morning so the sun was very much in the east, exactly in the wrong place for a front shot of the engine unless you wanted a lot of glare. But, the steam was so thick that if you positioned yourself just right it blotted out the sun. When I was doing the night shots, light was beautiful; today, shadow was my friend. You could feel the temperature change too. It was pleasantly cooler in the shadow of the steam, like being in an eclipse. This presented a great, if fleeting, opportunity for an uber-industrial and somewhat sinister silhouette of 844 with its singular yellow eye. 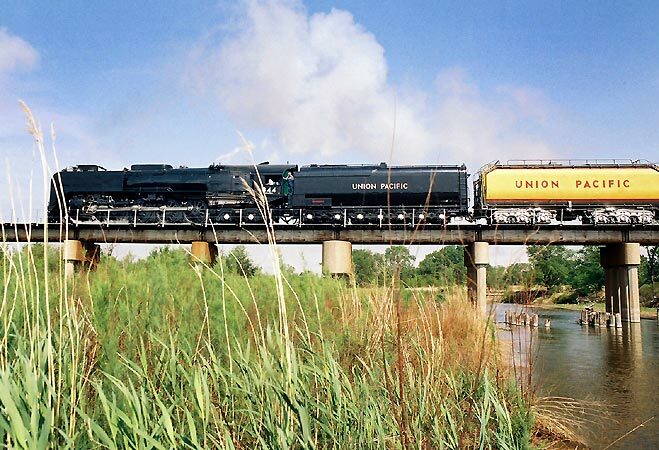 844 departed the Hutchinson depot at 10:30AM and crossed the Arkansas River a few minutes later. I wanted at least one shot that betrayed no sign that it wasn't 1944, and this may be it. It reached its next destination, Pratt, KS, over two hours early. I caught up to it again on May 27 in Claremore, OK, which you can see here. 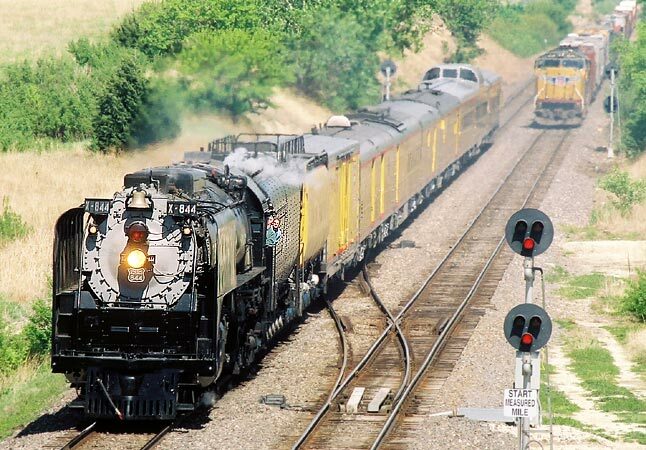 And, we actually rode it on May 28 from Claremore to Kansas City. I'll post that very soon! Great article! Very well done! Wow! 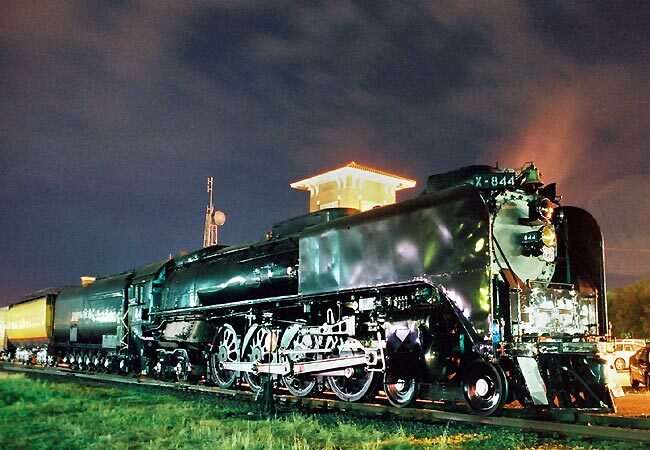 You are lucky to live so close to an operational steam locomotive. 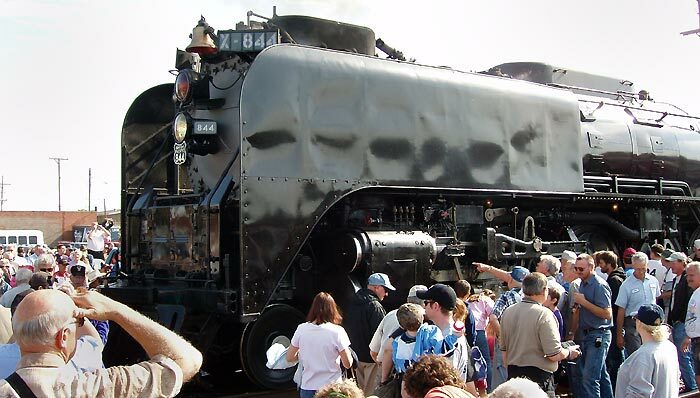 The nearest operational steam locomotive from my town is only 150 miles south , and is one of only two survivors of it's class,and is also a 4-8-4 Northern. Don't ask! It's Miluakee Road #261! Go to 261.com for more information on it!